FlexyVcard is an impressive and professional online v card, a beautiful portfolio with sliding effect, resume and contact information with Google map. It’s simple! Just download and install in a few minutes, you can show your online card to your friend, customer or employer in an interview by phone or tablet. Because FlexyVcard is a responsive html theme, you can view your website on pc as well as handheld devices. You can also link to your social profiles, display your portfolio in many media format such as image, YouTube video, flash…. From the back-end, you can choose skin for your website. FlexyVcard supports 10 unique color skins (Yellow, Red, Green, Blue, Gray and rose…). 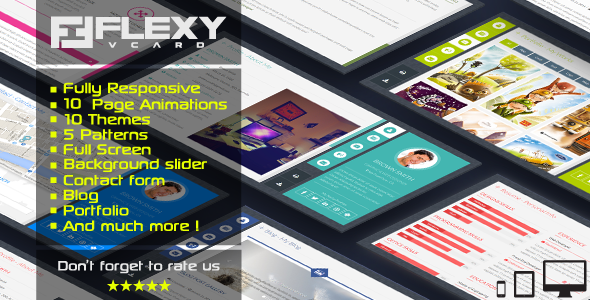 0 Response to "FlexyVcard – Responsive Vcard Template HTML – ThemeForest"